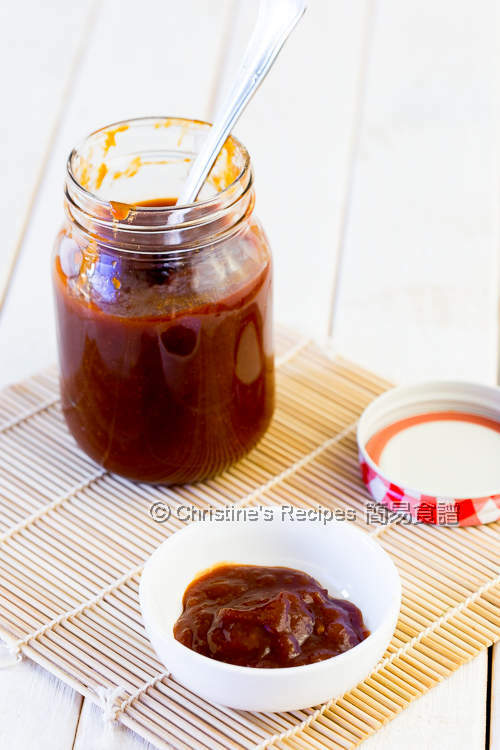 BBQ sauce is widely used in basting grilled meats or as a marinade, excellent on pork ribs and chicken. It’s so easy to whip up your own. Simply put all the ingredients together and take some time to cook them down into a thick sauce. 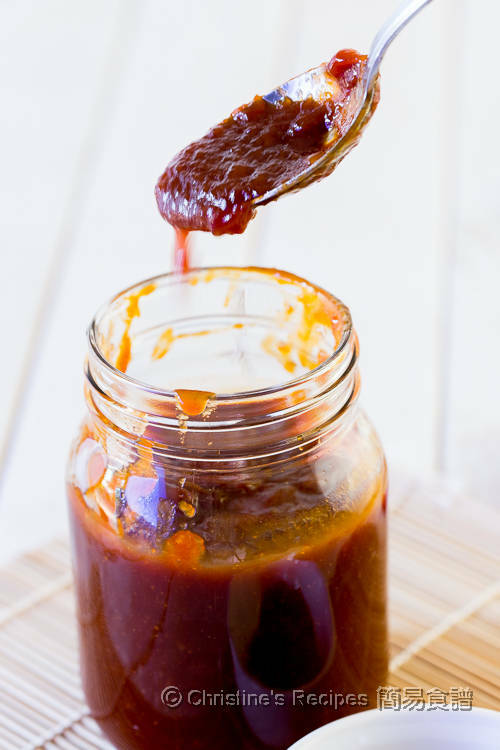 The sweet-tomatoey sauce base balanced with a bit of acidity and a mild hot kick makes this BBQ sauce version so unique and flavoured by my family. The cayenne pepper is optional though. You may skip it if you have young kids at home. Feel free to adjust the amount of sugar and vinegar to suit your palate. Use a deep heavy-based pot, heat oil over medium heat. Add the onion and cook until softened. Add the garlic, salt, pepper and brown sugar. Cook for about 2 minutes. Pour in the remaining ingredients. Bring it to boil. Reduce heat and simmer for about 20 to 25 minutes. Stir constantly. The sauce should get thicker and thicker. Taste and add more vinegar and sugar if needed. Let it cool a bit. 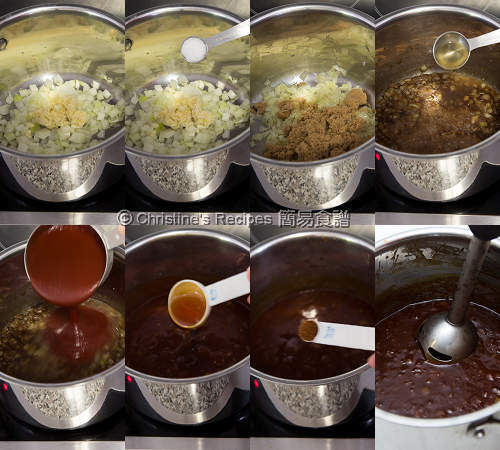 Blend the sauce into a smoother texture with a stick blender. Done. Ground cayenne pepper is mildly hot, available at supermarkets. If a stick blender is not handy to you, you can cook the onion longer until it turns really soft and completely broken down. 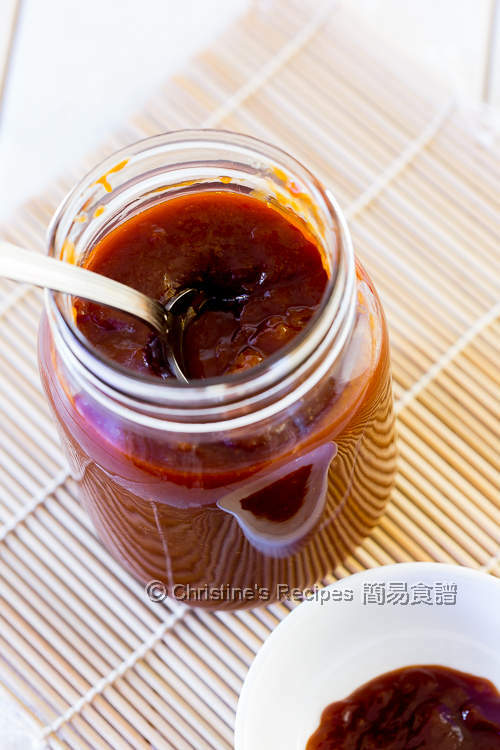 The sauce can be stored in a sterilized jar in fridge up to 3 weeks. To sterilize a jar: Boil the jar in boiling water for 10 to 15 minutes. Then drain dry. Or put in an oven, heated to 100C / 215F, bake for 15 minutes. Turn off the oven and let the jar cool down in the oven. Then the jar is ready to use. Can I use pureed tomato (or even chili sauce?) instead of ketchup here? Sure, pureed tomato works too. Adjust the amount of sugar accordingly then.